Since part one of this series we've been on several tours that did not equal a record store for one reason or another. Middlebury in Vermont has no record stores for one, preferring to outsource its music shopping to Burlington, at least an hour to the north. Our trip to Connecticut College was tightly scheduled before an important family occasion so I admit to not even Googling the situation. Brunswick, Maine, the town that contains Bowdoin, had an intriguing looking store on the main drag that had a sign saying "Vinyl," but we had to get on the road after indulging over at Gelato Fiasco, a sacrifice I don't regret one bit. But this past weekend was Amherst, which not only boasts membership in the Five College Consortium but also proximity to at least as many music emporia. Most of the pins on the map fell just to the west of Amherst, in Northampton and Florence, but the town itself has one store of its own, Mystery Train, which is inexplicably closed on Saturdays, even when school is in session. "Small business fail," my wife remarked as we tucked into the marvelous Tea Rolls at Fresh Side, and I'm inclined to agree, although they are open on Sundays. So after lunch we drove the six miles to Northampton, which is also a bit of a drive down memory lane for me. My parents both had chronic musculoskeletal issues, especially my father who was nearly crippled by them at times. Somehow they discovered an amazing chiropractor in Northampton, which is about an hour from our country house. I never minded being dragged along to see Dr. Kemper because Northampton was such a great town, even for a kid, and there was a serious ice cream shop in walking distance from his office. Dr. Kemper even worked on me once - and he was everything he was cracked up to be (sorry). But it wasn't long before ice cream took second fiddle to a record store I found just down the street. I bought some of my first used records there, including a beautiful-sounding copy of Dylan's Desire that I still treasure. While I can't remember the name or exact location of that store, I am heartened to discover that Turn It Up is holding it down just off the main street and down a few steps. On the map I was a little confused about whether Turn It Up was a nickname for a branch of Newbury Comics, but it turned out they were just across the street from each other. It's a testament to Northampton's record-buying culture that the two stores can coexist in such close proximity. They are distinctly different experiences in any case, with Turn It Up being a great example of a classic record store with a ratio of probably 85% used stock (on vinyl, CD and cassette) to 15% new releases. They also had movies on DVD and BlueRay. Newbury Comics on the other hand has records, movies, geeky toys and accessories, and, of course, comics. When I entered Turn It Up I didn't really have anything particular in mind at first so I was pleased to discover a robust New Arrivals section which was mostly cross-genre, with supplements for Blues, Soul, Country, etc. I began flipping, happily noting that most everything was reasonably priced. The few exceptions were those "limited edition" colored vinyl releases that were in many cases merely lipstick on a pig. But if you love a pig, you'll pay the premium to make it pretty, I guess. I quickly found an intriguing compilation called simply Electronic Music, which looked to be from the early 60's and featured an early work by Walter Carlos - before he became Wendy and had international success with Switched On Bach and the soundtrack to 2001: A Space Odyssey. I also found a double album compilation of songs by Black Roots, one of the key bands in the Bristol Sound of British reggae. Both albums went on the pile for the moment. When I was nearly done, there was a woman who was just starting to flip. "Let me know if you find any Hot Tuna," she whispered loudly to her friend across the room. "What?" he responded, "Why are you whispering?" "Yeah," I interjected, "no need to whisper, no judgment here!" After all, Kenny Rogers' Greatest Hits was playing. "Besides, Papa John Creach rules!" "Oh my god, I love him," she responded. I told her how my sister was a huge Hot Tuna fan and had all the albums, including the violinist's solo record. "That was the only one I really liked," I related, "but I hope you find something today." Guess what - she did, and for just $3.00. The only thing better than finding your joy in the record store is finding it cheap! The new arrivals skimmed, I wandered around a little bit, seeing what caught my eye. While checking out the box sets I overheard one of the guys behind the counter rhapsodizing over a Montreaux appearance by Rahsaan Roland Kirk as he rang up a sale of a CD by the avant garde jazz reed player. "By the way," I mentioned, "Something came into my inbox about a new documentary about Kirk. I didn't get a chance to follow up yet but it might be worth checking out. Pretty sure it's the first film about him." "Wow, cool," said the happy customer, "I'll definitely look into that!" Sure, you might have this kind of interaction on a listserv or in a Facebook group - but it feels different face-to-face. One last circuit and I spotted a Bill Nelson section in the CD's. I used to literally be in his fan club (I have the marvelous exclusive singles and EP's to prove it) but I don't actually have any of his stuff on CD and his music is only patchily represented on Spotify. This made What Now, What Next, a 1998 two-CD set compiling songs from his own Cocteau label, mighty attractive at $8.00. I'm glad I got it, too, as many of these songs are old friends for me while some of them are brand new, having never been released elsewhere. It could be argued, however, that Nelson may have been at times too enthusiastic in his embrace of 80's electronics - and that some of his Be-Bop Deluxe stuff sounds better than ever. My meter was running low and my wife and daughter had transitioned from the hunt for second-hand clothes to the hunt for caffeine. This meant it was time to finalize my choices. A quick check of Spotify and I saw that most if not all of the Black Roots songs were on there so I put that album to the side. I inspected the Electronic Music album and it had some worrying discoloration on the vinyl. Not to worry - there was a turntable and headphones in the corner so I gave it a preview and it sounded great. Sold. A complete listen when I got home revealed a beautiful series of sounds occupying a nearly perfect middle ground between Edgard Varese's Poeme Electronique and some of Eno's Ambient work, a dotted line that needed to be drawn. 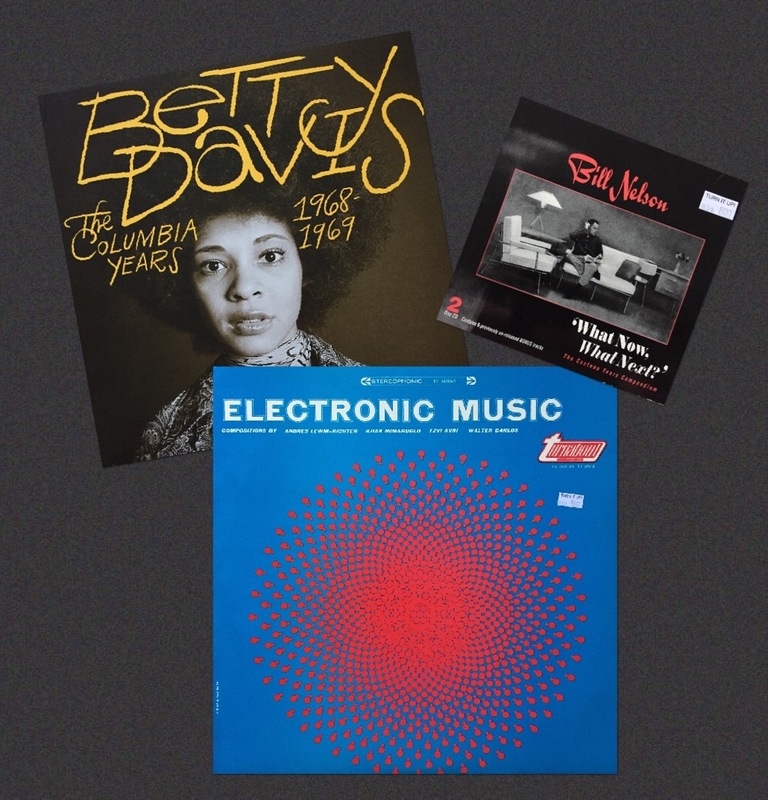 While I was paying I suddenly remembered the new Light In The Attic Betty Davis release, featuring a lost session produced by Miles Davis. They didn't have it, but they did have a loyalty card which gets stamped for every $10 you spend. Ten stamps and you get $10 off your next purchase. I think I'll definitely get back to Turn It Up, even if my daughter doesn't go to Amherst! I'm also delighted to discover that Turn It Up has a handful of branches, if far fewer than Newbury Comics, so I might have another opportunity to get a stamp sooner than I thought. I had a little more time so I dashed across the street to Newbury Comics for a Betty Davis surgical strike. The guy at the counter seemed vaguely aware of the album when I asked if they had it, saying "We should," and punching numbers into an inventory terminal. First he led me to the CD's and started looking. I indicated that I wanted to get the vinyl version so he brought me deeper into the store and started looking through the rock vinyl, unsuccessfully. "If you have a funk and soul section it might be in there," I offered. They did! Done. There's no loyalty card at Newbury but they did add my email to their mailing list, which is another way to try to continue the relationship. And isn't that what it's all about - relationships? I don't make a habit of unfriending people for having contrary opinions. However, this resolve is not tested often as it just so happens that at least 90% of my social (media) circle is made up of left-leaning, pro-choice, anti-LGBTQ discrimination, pro-civil rights social justice warrior types. But there's one hot button issue where I feel like a minority in my own newsfeed: Kanye West. While I value my friends and acquaintances for other reasons, the unfortunate fact is that some of them have no problem parroting commonly held groupthink about Kanye, namely that he is no-talent, idiotic, egotistical jerk. While I can't necessarily defend his actions in some cases, I will speak up for the records as I have formed a deeply personal relationship with most of them. Even so, I didn't realize I was feeling musically oppressed until I walked into the sleekly renovated halls of Madison Square Garden one recent evening and found myself surrounded by thousands of Kanye fans - and they were amped. There was an excited buzz and sense of camaraderie even among those on the hideously long lines for merch. A security guard noted my Mobb Deep t-shirt and I said "Yes - I thought I'd bring some New York flavor to the show." "You actually listen to this stuff?" he asked. "Hell, yes," I responded, "I've been listening to hip hop since the days of Grandmaster Flash & the Furious Five!" These are my people, I thought, and it felt good, even before I knew what the night held in store. Let me rewind for a second. A week prior, I had no idea I was going to see Kanye. Tickets went on sale in the spring and just couldn't plan that far in advance, especially with all the college tours we knew were on the horizon. Also, I had already bought tickets for Dylan and Mavis Staples at Tanglewood and wasn't sure I had another big ticket concert in me, especially with the prospect of a bot-fighting refresh refresh REFRESH session on Ticketmaster. I heard the concerts sold out in seconds. My nephew had managed to secure a block of tickets for my sister's family - on three different nights in three different cities. I was glad to avoid that kind of drama. Then, the Friday before Labor Day, I got an email from Ticketmaster telling me new seats had been released. Feeling skeptical but spontaneous, I clicked the link - and saw row after row of seats at $226 per. Not happening. In a last ditch click, I re-sorted the list low to high and voila! Affordable seats! They were high up and described as "rear view" but having read the review of the opening night I didn't think that was important, with the moving stage and everything. After a quick consultation with my wife, I pulled the trigger on tickets for me and my daughter. So that's how we found ourselves in the 413 section of the Blue Seats in MSG, watching the crowd assemble to a soundtrack of ambient, ominous sounds reminiscent of the darker moments from Fripp & Eno's Evening Star. Fog machines started up, adding to the sense of anticipation and mystery. There was a swirl of activity around us as people repeatedly took the wrong seats and then had to relocate when the actual ticketholders showed up. These transactions were all uniformly polite and good humored. There were no grievances in our little section of the venue - I've been to opera performances where the crowd was less well-behaved. Filling the arena was a slow process but it gave us an opportunity to observe the massive rig Kanye's crew had assembled around and over the floor. We watched as black clad technicians wearing harnesses took their places high in the rafters and contemplated what their nights were like, huddled at great heights near the roof of one arena or another. Finally, at about 9:45 PM, the fog machines kicked into overdrive, the lights blacked out and the crowd went nuts. I could just barely make out the platform closest to us tilting backwards into a cloud of smoke. When it returned to level, Kanye was there and the excitement exploded as everyone jumped to their feet, cheering louder than ever. Father Stretch My Hands, Pt. 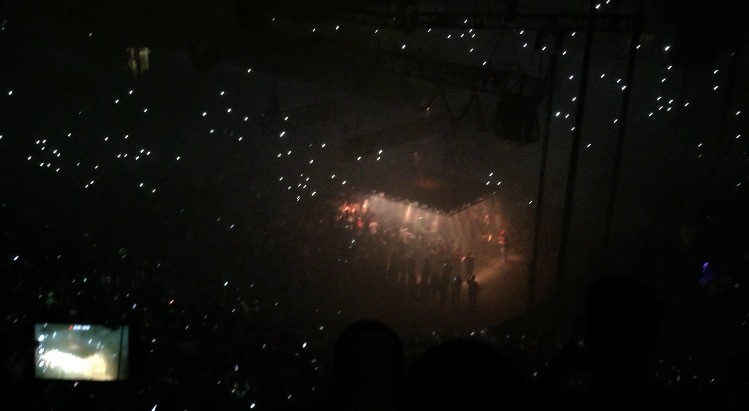 2 kicked in, Kanye began rhyming, and the entire crowd - about 20,000 people - matched him word for word. It would have been thrilling even if Kanye's platform hadn't began moving over the floor, illuminating the masses underneath as they writhed manically, dancing their asses off. Smartphones went up all around the arena, looking like beautiful constellations and giving the lie to all those artists who would ask you to check your device at the door of the show. By the second song I realized the brilliance of Kanye's conception: he had made the crowd into the show. Considering how often the charge of egotism is lobbed at him, it was almost ironic how much the concert invited our participation and elevated the individuals in the audience, transforming us into full participants, especially those on the floor. On more than one occasion, Kanye even began a song again so the sing-along could kick off in unison and we could all be together. Unlike his recent rambling and unfocused remarks at the VMA's, Kanye was in full command of his performance, barreling through songs in quick succession, dancing athletically in a fashion that did not seem overly choreographed while making full use of his tethered status on the platform. He only let up during the couple of moments when his platform would retreat to the end of the arena to allow for an enormous central platform to engage in a sort of ballet mecanique, twisting and turning this way and that, illuminating different sections of the audience with banks of spotlights. Kanye also pushed the limits of his constant near-accessibility by lying down on the platform and extending a hand to the gyrating masses. Even this gesture felt humble rather than magisterial and electrified the whole arena. About a two-thirds of the way through, Kanye also revealed that he wasn't alone after all, shouting out singer Tony Williams, who has provided hooks since West's first album, and bringing up the lights at the south end of the arena to reveal his band. I couldn't see what configuration he was using but it looked like more than just a DJ and a vocalist. The setup also included the usual giant screens, but instead of giving close-ups for those far from the action they displayed artfully distorted visions of what was taking place down below. 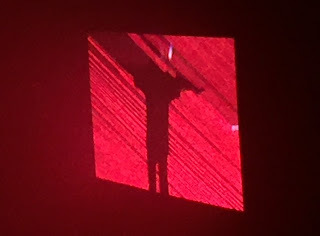 While the staging felt like the future, the setlist took judicious turns to Kanye's past, with killer takes on Can't Tell Me Nothing, Power, Heartless, Blood On The Leaves (a daring choice) and especially the mighty New Slaves and Jesus Walks. If any song in his catalog was meant to be sung by 20,000 people it was the latter - indeed, that may be the definitive way to experience this classic track. Naturally, there was a big helping of The Life of Pablo, whose scattershot songs ended up working great in concert, with the possible exception of Wolves, which was slightly stilted out of the studio. Kanye sequenced the show like a great mixtape, dropping in THat Part, the Schoolboy Q song-of-the-summer on which he has a feature, and ending with Ultralight Beam, Pablo's opening cut. As the over-the-top gospel stylings filled the arena in a way that was almost overwhelming, the fog grew in intensity and Kanye's platform parked itself at one end of the floor, tilting backwards in a mirror image of his arrival. Then the lights came up and he was gone. Kanye had left the building. Would I have stood for another song or two? Sure. But this was more memorable and as they used to say in vaudeville (and probably at Shakespeare's Globe or even the theaters of Ancient Greece): Always leave them wanting more. The glow of the night continues to echo in the days since, armoring me against my naysaying friends. I don't think I'll have any problem laughing it off the next time one of them gets apoplectic about something stupid Kanye said. I've been to the show and they can't tell me nothin'.